In the island of Lefkada, earthquakes are considered as the main causal factor of slope instabilities according to the seismic catalogues. 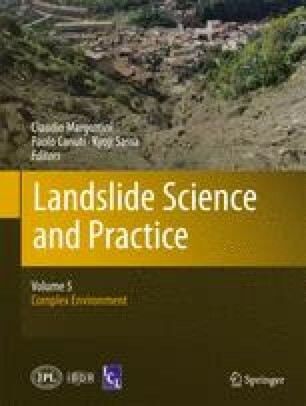 In this study, the temporal probability was estimated as a joint probability of the exceedance probability of earthquake threshold per decade and the probability of landslide occurrence once the threshold has been exceeded. Initially, landslide inventory maps were compiled for the instrumental period of seismicity in Greece, indicating that the occurrence of landslide phenomena is mainly concentrated within the western part of the island. For this period, 21 earthquakes were recorded with magnitudes M > 5.3 and 6 of M > 6.0, while five landslide events were defined. Thus, the mean recurrence interval per decade between successive threshold exceedance was estimated at 0.48 and 1.66 for earthquake magnitudes M = 5.3 and M = 6.0, respectively. Taking into account that the probability of occurrence of landslide after the threshold has been exceeded is 0.23 and 0.83 for M > 5.3 and M > 6.0, the estimated temporal probability of earthquake-induced landslides for different time periods, from 10 to 500 years, ranges from 0.2 to 0.23 for earthquake magnitudes M > 5.3 and from 0.37 to 0.83 for magnitude M > 6.0.